When I started this blog earlier in the week, I mentioned that the name Every Treasure was inspired by the saying ‘Every cloud has a silver lining’. Little did I know that by the end of the same week I would actually be walking in the clouds! 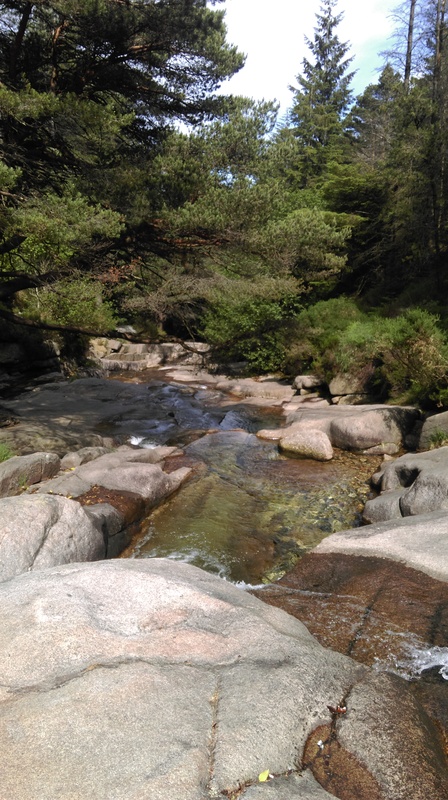 A few members of my family suggested a hike up Northern Ireland’s tallest peak, Slieve Donard, and of course I was keen to go, loving everything to do with the great outdoors. 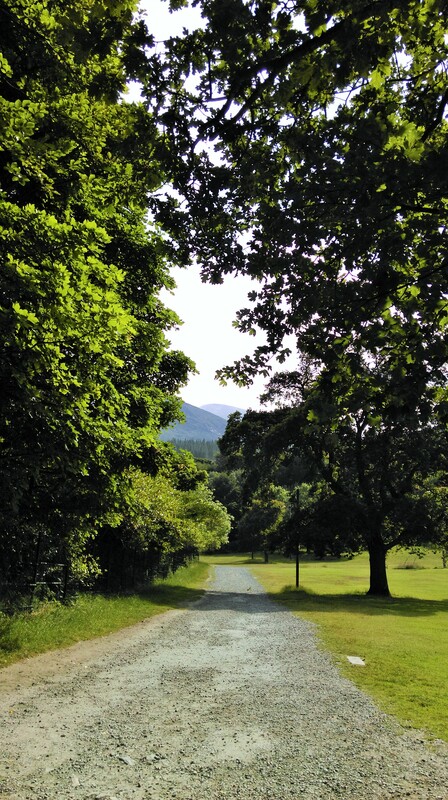 So, with my 3 kids lacquered in sun screen, walking boots on and rucksack full of sandwiches we departed Belfast early in the morning to meet up with Granda, uncles and cousins in the Slieve Donard car park at the base of the 850-metre mountain. On arrival in Newcastle, County Down, I was so excited about the big walk ahead that I let out a few ‘whoops’ that had my boys looking at me like I had confirmed their suspicions about me being crazy. But there’s something quite exhilarating about rounding the bend into Newcastle and seeing the Mourne Mountains reaching up into the clouds. Their scale puts life into perspective and the sight of them always makes my heart sing! The sun was shining as we set off and we agreed what a perfect day it was for a hike. 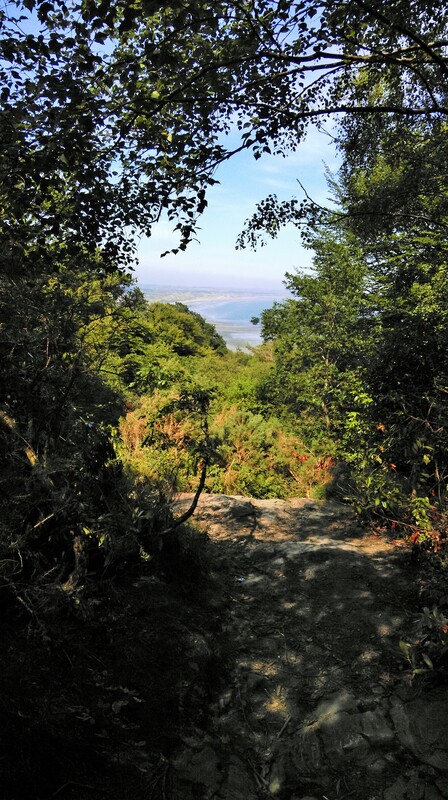 The 5 kids in tow were enthusiastically on the lookout for the perfect rock pool to swim in, but we had to tell them to wait until our way back down before any swimming could take place – mountain climbing in soggy socks and shoes is never pleasant! As we ascended up past the Ice House we could barely see the path ahead as the clouds quickly descended but we kept heading upwards, hoping in earnest that the sun would break through and the clouds would clear by the time we reached the summit and we would be able the enjoy the spectacular view over Newcastle and the Irish Sea. 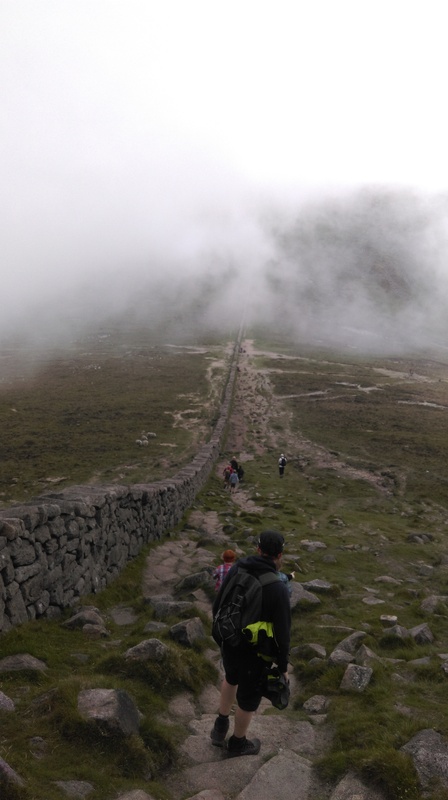 By lunch time we had reached the 22-mile long Mourne Wall which runs through 15 of the Mourne Mountains. The clouds were thick by this stage and a cool breeze meant we couldn’t stand around for too long. After a quick fuel stop we agreed that we had come too far to be deterred by a few clouds and so determined not to turn back we headed off again, this time up a steep, rocky track towards the summit. I should probably mention that the children in our party were aged 5, 6, 7, 8 and 9. Their little legs had already endured a good hike to reach the wall but they were all super keen to get to the top of the mountain. I was already impressed by their stamina, but their enthusiasm impressed me even more. They were tired and cold. The wind had picked up and we could barely see 20 metres ahead. Part of me envisaged the rescue helicopters swooping in to pick us up and the mountain rescue squad lecturing us for taking kids so far up the mountains. We got talking to a few other hikers who were on their way back down and they said it was definitely windy at the top but certainly reachable. So, with that to encourage us and the kids eager to continue, we put our heads down against the wind and faced the steepest part of the climb. After about half an hour we reached the top. What a feeling! 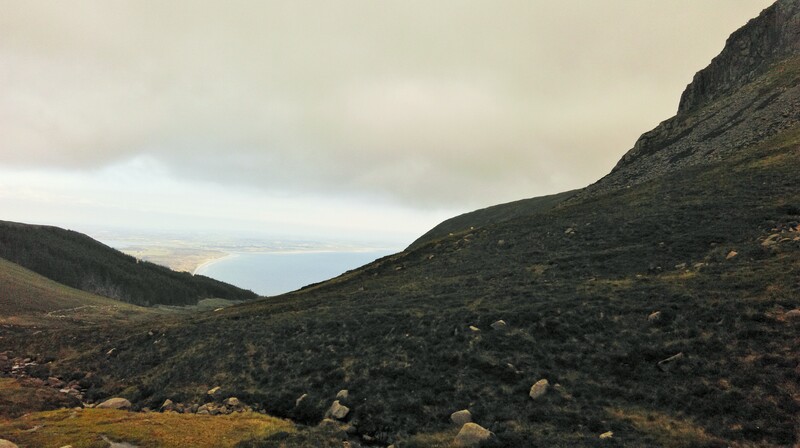 It was my first time on the top of Slieve Donard too, despite having walked in the Mournes on many occasions and even having completed my Duke of Edinburgh there. The wind nearly lifted the kids off their feet, but they were not put off from climbing the pile of boulders that marks the summit point. We sat atop the rocks, heads in the clouds, hair dripping wet with no view to be viewed, just the sense of achievement at having climbed the tallest mountain in Northern Ireland. It was uplifting to watch everyone beaming proudly, especially the little faces that looked as though they had reached the top of the world – I suppose they had reached the top of their world! This is our party on the descent. As we continued back down the rocky path, the sun was trying desperately to break through and we did catch the odd glimpse of Newcastle in the distance. By the time we neared the bottom the clouds had finally cleared and we were able to enjoy that long awaited swim. 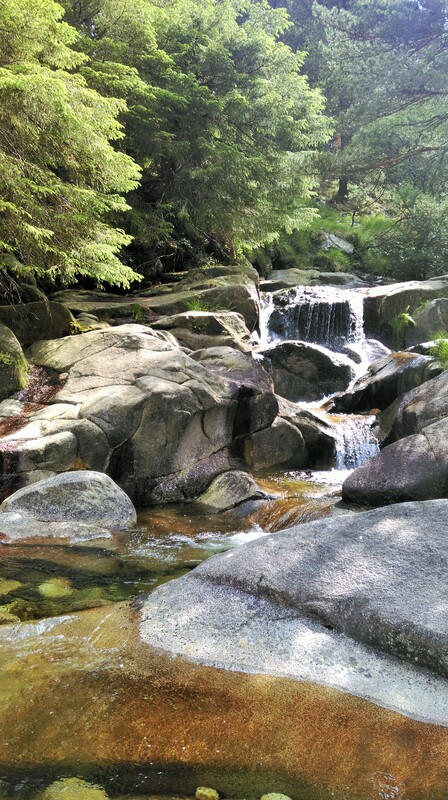 After a 5-hour walk it was so refreshing and well deserved. Watching the children sliding down the rocks into the clear pools was just the perfect ending to a great day. We didn’t spend a single penny today, and as we neared the car the kids were raving about how much fun they had had and “when can we come to the mountains again” was asked repeatedly. I knew my kids were fit and healthy, as are their little cousins, but if I had been asked could they climb Slieve Donald in a day and not moan about it I would have been sceptical. It just goes to show that we should never underestimate our kids’ abilities, or our own for that matter. I wouldn’t have believed I could get 3 kids up the mountain and back down in one piece without pulling my hair out! No rescue helicopters needed thank you very much! The Mourne Mountains truly are stunning and there are so many walks to explore. Visit http://www.walkni.com to find out about some of the routes you can take – just remember to pack a light jacket, because the weather can change so quickly as we discovered today! I’ll guarantee you won’t be disappointed after a day spent walking through the beautiful mountains of Mourne. It is definitely time well spent. 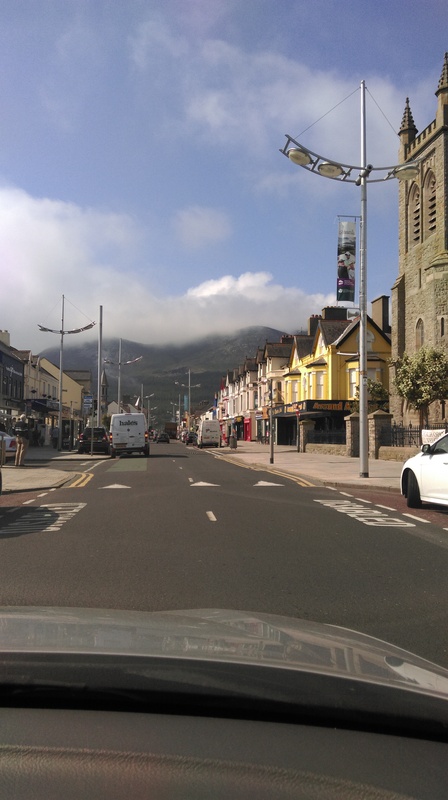 When we reached the Slieve Donard car park and looked back we could just see the top of the mountain we had spent the day conquering – it was finally cloud free! We didn’t get to enjoy the picturesque scenery from the top but in looking back up to where we had been it was actually more astonishing to see our accomplishment from ground level. We did it! The children were all exhausted so we loaded them into the cars, said our goodbyes, agreed to meet up again soon and went our separate ways. As I drove through Newcastle, homeward bound, I was pleased we hadn’t spent our day in the noisy arcades, wasting our money in slot machines. Other than money for fuel and a basic picnic, I hadn’t spent anything and yet the boys were all happy and looking forward to meeting up with their cousins again soon to further develop their explorer skills. 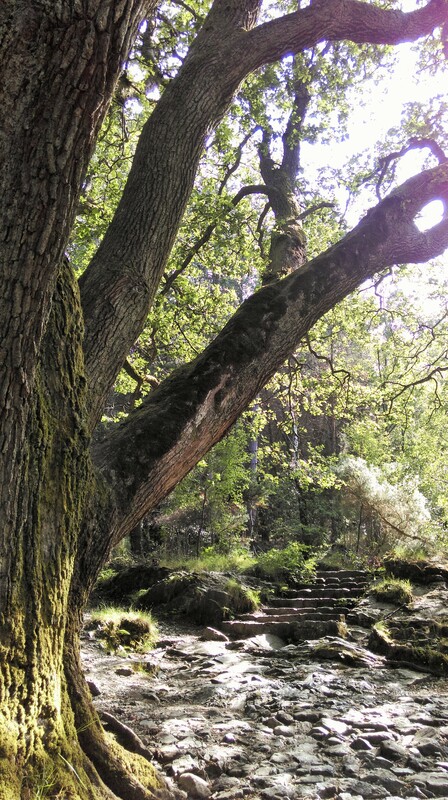 Watch out Bear Grylls – there are new kids in town… or rather new kids in the mountains! Before I left Newcastle, I glanced in my rearview mirror and the boys were all fast asleep. The quiet drive home gave me time to reflect on how much I had enjoyed the walk, how proud I was of all the kids but mostly how much I had really loved spending time with my Dad, brothers, nephews and sons. The chat had been easy, though the climb was tough. There was laughter and encouragement and I look forward to another hiking day soon. I guess even the clouds in the Mournes have their silver linings! Hi kel just mum here…wonderiful blog loved it, what an amazing daughter you are, very proud of you for a lot of different reasons.